Ferdinand is a computer-animated children’s comedy/adventure distributed by 20th Century Fox. 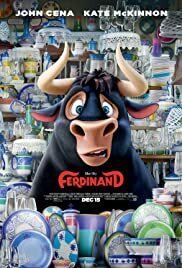 The title character Ferdinand (John Cena) grew up on a Mexican ranch that breeds bulls for bullfighting in the arena. The bulls compete with each other for the honor of being chosen for a bullfight, with the idea that they will defeat the matador and win eternal glory. But young Ferdinand doesn’t want to fight, and one day he runs away and is adopted by Nina (Julia Saldanha) and her family where he is raised as a beloved pet, and he lives happily there for a time. His favorite time of year is the flower festival, because he loves nothing more than smelling flowers. But when he is fully grown, they tell him he can’t come along because he is too scary at his full-grown size. He sneaks into town anyway, but is considered a threat to the populace and is sent back to the ranch where he meets the other bulls he knew as calves. The other bulls treat him poorly, but a nanny goat named Lupe (Kate McKinnon) decides to take him in and train him to be a fighter, but he’s no more interested in fighting than he was before, and the only way he might be able to avoid fighting is if he can escape.